Identified in 1988, Hepatitis C virus (HCV) is the major aetiological agent for what was previously known as non-A non-B hepatitis. HCV is estimated to infect 180 million people worldwide and HCV infection can lead to chronic infectious hepatitis disease with serious sequalae. Interferon-, or its PEGylated from, plus ribavirin is the only treatment option to combat HCV. Alternative and more effective therapy is needed due to the severe side effects and unsatisfactory curing rate of the current therapy. HCV contains a positive-sense RNA genome encoding a polyprotein precursor that needs to be processed by proteases including the NS4/3A protease for viral maturation. HCV NS3/4A protease is thus essential for viral replication. Encouraged by the success of HIV protease inhibitors since early 1990s, scientists have considered HCV NS3/4A has an attractive target for drug discovery against HCV replication. However, no drug has yet been successfully developed for HCV treatment based on NS3/4A as the molecular target. We have employed a cell-based protease assay for discovery of NS3/4A protease inhibitors since we speculated that NS3/4A may assume different conformational features inside cells. Starting from this cell-based protease assay, we discovered a class of potent HCV inhibitors, the BPRHC class, with a unique mode of action. Using biotin-labeled drugs and streptavidin-agarose affinity chromatography, we showed that the BPRHC compounds bind to an allosteric site within the NS3/4A protease complex. Lead compounds are being optimized and the ones with favorable pharmaceutical properties will be selected for preclinical development. My lab is interested to understand the structure-function relationship and biogenesis of a group of prolyl-cleaving dipeptidases including DPP-IV, DPP8 and FAP. DPP-IV is a membrane-bound protease, and a validated drug target for human type II diabetes. We found that DPP-IV is dimeric, and dimeric structure is essential for the optimal enzymatic activity (Chien et al., JBC 2004, Chien et al., Biochemistry 2006). Single site mutation could disrupt DPP-IV to monomers, with the concomitant loss of the enzymatic activity. Moreover, dimer and monomer do not equilibrate at all in vitro. Based on the mutational studies, this lack of equilibrium could be explained by the conformation of the propeller loop upon monomer formation (Chen et al., in preparation). This suggests that DPP-IV might have to be synthesized and assembled co-translationally as a dimer, bypassing the monomer formation. The interaction mode at the dimer interface between DPP-IV and DPP8 is different: mutations at dimer interface could not disrupt DPP8 dimer into monomers, and these mutant dimers are enzymatically inactive (Lee et al., JBC 2006). Recently, we discovered that the transmembrane (TM) domain of DPP-IV is also dimerized, and the mutation on the TM domain affected the enzymatic activity located extracellularly (Cheng et al., JBC 2008, in revision). Thus, DPP-IV is a dimeric protein with three dimer interacting regions, and each interface is critical for its enzymatic activity. Intriguingly, we found that some mutations located at the TM results in the failure to make the full length DPP-IV in vivo. Using these mutants, we are in the process of understanding how DPP-IV is produced, inserted into ER, and assembled through the ER translocation system. By dissecting each step for the biogenesis of DPP-IV, we hope to understand how other oligomeric membrane proteins are synthesized, translocated and exported to the plasma membrane. 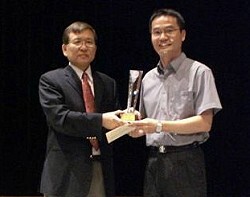 1.Chien, C. H., Huang, L. H., Chou, C. Y., Chen, Y.S., Han, Y.S., Chang, G. G., Liang, P.H. and Chen, X. * (2004) One Site Mutation Disrupts Dimer Formation in Human DPP-IV Proteins. Journal of Biological Chemistry, 279:52338-52345. 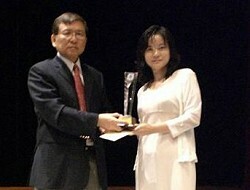 2.Chien, C. H., Tsai, C. H., Lin, C. H., Chou, C. Y. and Chen, X. * (2006) Identification of Hydrophobic Interaction Critical for DPP-IV Dimer Formation. Biochemistry, 45:7006-7012. 3.Lee, H. J., Chen, Y. S., Chou, C. Y., Chien, C. H., Lin, C. H., Chang, G. G. and Chen X. * (2006) Investigation of the Dimer Interface and Substrate Specificity of Prolyl Dipeptidase DPP8. Journal of Biological Chemistry, 281:38653-38662. 4.Cheng, J.H., Suen, C.S., Chen, K.C., Hsu, L.J., Huang, L.H., Han, Y.S., Tseng, B., Chen, Y.R., Chang, H.P., Chang, G.G., Wang, A.H.J., Hwang, M.J. and Chen, X. * (2008) Dimerization of Proline-Containing Transmembrane Domain of Prolyl Dipeptidase DPP-IV. Journal of Biological Chemistry, under revision. 5.Chen, G. C., Liu, G.G., Huang, L. H., Chien, C.H., Chou, C. Y., Chang, G. G. and Chen, X. * (2008) Propeller Loop of DPP-IV is Essential for Maintaining the Integrity of Substrate Binding Pocket and Catalysis, Manuscript in preparation. With increasing globalization of development of medicines, developing strategies on when and how to address the geographic variations of efficacy and safety for the product development is now inevitable. To address this issue, the International Conference on Harmonisation (ICH) has published a guideline entitled “Ethnic Factors in the Acceptability of Foreign Clinical Data” known as ICH E5 (1998). The ICH E5 guideline defines a bridging study as a supplementary study conducted in the new region to provide pharmacodynamic or clinical data on efficacy, safety, dosage and dose regimen to allow extrapolation of the foreign clinical data to the population of the new region. Therefore, a bridging study is usually conducted in the new region only after the test product has been approved for commercial marketing in the original region based on its proven efficacy and safety. In Taiwan, the Department of Health has successfully developed a sponsor self-evaluation check-list, a decision-making tree, and consultation procedure. Requirement of bridging evaluation was formally announced on January 1, 2004. We will give some successful examples of bridging evaluation conducted in Taiwan. For evaluations of bridging studies, we propose a Bayesian approach with the use of a mixture prior for assessment of similarity between the new and original region based on the concept of positive treatment effect. Numerical examples illustrating applications of the proposed procedures in different scenarios are also provided. Polychlorinated biphenyls (PCBs) and dioxins are recognized environmental endocrine disruptors (EDs), which are environmentally persistent and may bio-accumulate in human bodies. People are constantly exposed through contaminated food mainly of animal source. These compounds, with half-life of 7-14 years in humans, may result in various adverse effects, including neuro-cognitive deficits, hormonal alterations, and certain cancers, particularly for organs/systems developed from fetus ectoderm. We hypothesized the health effects might relate to the exposure at early days of life in utero. We assessed the transfer of the persistent organic pollutants (POPs), including PCBs, dioxins, polybrominated diphenyl ethers (PBDEs), and organochlorine pesticides (OCPs), from mothers to their babies in the general population through placenta and breast-feeding. These infants were followed every two and half years at the age of 2-3, and 5-6 years for growth, development, cognitive function and gender-related behaviors. We established the free transfer of PCBs/Dioxins from mother to fetus. Prenatal exposure to PBDEs was found associated with lower birth weight and shorter birth length. We found a significantly decreased free thyroxine× thyroid-stimulating hormone (FT4×TSH) trend in cord blood with increasing in utero exposure to non-ortho PCBs (r= -0.2, p<0.05). It is suggested that decreased FT4 feedback to the hypothalamus was associated with prenatal exposure to non-ortho PCBs in neonates. Considering the vast existence of bio-accumulated dioxins and PCBs and the resultant body burden in modern society, we suggest routine screening of both thyroid hormone levels and thyroid function in newborns. We also found prenatal exposure to PCB/PCDF was associated with children dental defects such as congenitally missing teeth germ in a dose-dependent manner. A high ratio of 4-hydroxyl estradiol (4-OH-E2) to 2-hydroxyl estradiol (2-OH-E2) has been suggested as a potential biomarker for estrogen-dependent neoplasms, such as breast cancer. We found the ratio of 4-OH-E2:2-OH-E2 decreased with increasing exposure to 2,3,7,8-tetrachlorodibenzo-p-dioxin (TCDD) (β = –0.124, p = 0.004 by the general linear regression model) in pregnant women aged 25-34 years. Meanwhile, serum levels of 4-OH-E2 increased with increasing concentrations of high-chlorinated PCDFs (i.e., 1,2,3,4,6,7,8-hepta-CDF:β=0.454, p= 0.03). Exposure to PCDDs/PCDFs significantly affects estrogen metabolism. Therefore, PCDD/PCDF exposure must be considered when using the OH-E2 ratio as a breast cancer marker. The diabetes risk in women with previous high exposure to PCB/PCDF, relative to their reference subjects, was significantly doubled (95% CI 1.1– 4.5). For pregnant women with moderate exposure, we found decreased insulin sensitivity with increasing non-dioxin-like PCB body levels (r=-0.19, p=0.04). This may involve an estrogen-dependent peroxisome proliferator–activated receptor (PPAR) pathway. Obesity as a risk factor for diabetes might be attributable partly to the lipophilic compounds’ storage in white adipose tissue. Although human studies in the community may limit to accurate dosing and timing of exposure, we have identified the prenatal insult from endocrine disruptors and the long-term heath effects in pregnant women and their children. Copyright (C) National Health Research Institutes, All rights reserved.